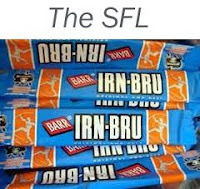 The SPL Brylcreem boys don't get going for another week but senior league football returns to these shores tomorrow with the IRN-BRU First, Second and Third Divisions getting underway. I've done a quick headcount and it appears that all the teams that finished last season are still alive and - to varying degrees - kicking, so that's something. And, with Brechin's charity shirt logo and Stirling Albion's fan ownership, two SFL clubs are doing a far more passable impression of Barcelona than any SPL sides can manage. Somebody at the Scottish Football League actually seems quite switched on at the moment and they've got a shiny new website that you really should check out. BBC Alba will continue to provide some TV publicity and SFL TV will carry online highlights on the website. Scotland struggles to sustain even a top flight of 12 teams. So the SFL is always, always going to face problems. But maybe this year they are ready to come out fighting rather than lying in a darkened room whimpering about how nobody loves them. In an ideal world all the clubs would be supported and sponsored well enough to break even, each league would be competitive from top to bottom and there would be a constant supply of fresh young talent moving through the leagues. But this is Scotland, not some strange footballing utopia. Some of those aims should be achievable but in the meantime we need to make do and mend with what we've got. For now let's just welcome back league football and hope that things get going with a bang tomorrow afternoon. *If you'd like to cover any of the SFL divisions or write club specific posts then get in touch. No payment I'm afraid but you'll get to see your name up in lights italics.